A patent granted to Apple on Tuesday reveals a novel mode of mobile device gesture input that turns taps detected on non-touchscreen surfaces, like the side of an iPhone, into granular on-screen controls. 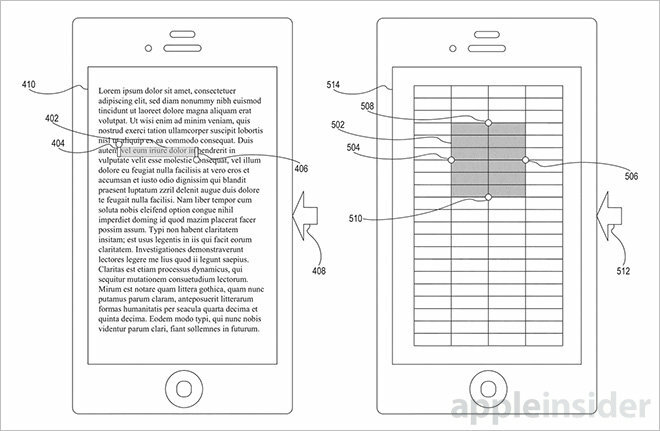 As published by the U.S. Patent and Trademark Office, Apple's patent No. 9,086,738 for "Fine-tuning an operation based on tapping" describes a solution to a problem many iPhone and iPad owners face when attempting to conduct highly granular user interface manipulations on multitouch displays. As Apple notes, touchscreens excel in operations requiring only coarse granularity, such as swipes and taps, but are often times unsuitable for performing fine adjustments. For example, picking out a specific character in a line of text is difficult on a touch interface because the mechanism relies on an input object with a relatively large contact area (a user's finger). Apple's iOS features a virtual magnification loupe as a workaround for accurate UI asset selection, but the method is not as precise as a traditional computer mouse. 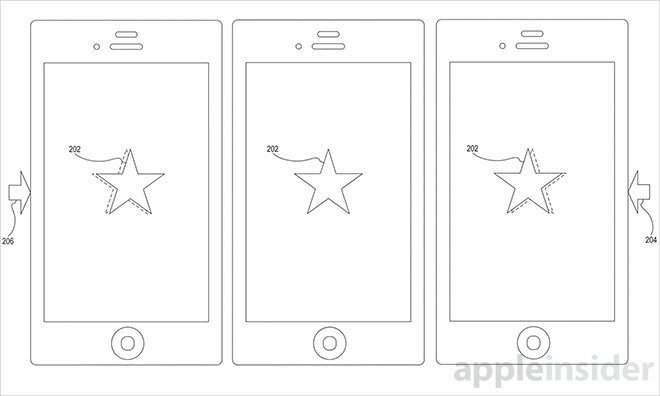 Instead of looking for an answer in multitouch screen technology, Apple's patent makes use of motion sensors available throughout its iOS device lineup. In one embodiment, a user is able to move an onscreen object left or right with extreme precision, perhaps nudged a pixel at a time, by lightly tapping on the side of an iPhone. Tap gestures on non-touchscreen portions of a device are picked up by an accelerometer or gyroscope and processed naturally, meaning inputs are represented onscreen in an equal and opposite direction. For example, a light tap on the right side of an iPhone would move an object to the left, while a tap on the left would send the object to the right. The patent also accounts for varying input magnitudes. Stronger taps move objects greater distances, for example. Another embodiment detailing text selection notes users can easily extend or contract an active boundary through suitable tapping procedures. Lighter taps would move the cursor one character at a time, while more prominent taps jump entire words or lines. The idea can be extended to any number of selection or virtual object manipulation operations, as seen in the above illustration relating to a spreadsheet application. Apple also covers taps in other directions, for example from the top and bottom of a device, as well as input involving more than one finger and other UI variations. It is unclear if Apple intends to incorporate the tap-based fine tuning mechanism into its iOS platform anytime soon. However, the company is slowly extending device usability beyond the years-old multitouch interface by augmenting its devices with new forms of input like Force Touch, which is rumored to make the jump from Apple Watch to iPhone this year. Apple's patent for fine UI manipulation through tap gestures was first filed for in January 2013 and credits Maxim Tsudik as its inventor.